President Barack Obama's fiscal 2011 budget request for HHS does not make specific provisions for healthcare reform, though it acknowledges that reform is sorely needed, HHS Secretary Kathleen Sebelius said at a briefing. Obama's $3.83 trillion budget blueprint assumes that healthcare reform, if enacted, could reduce the federal deficit by $150 billion over 10 years, but that assumption is applied on a governmentwide scale, and is not specific to HHS. Sebelius, in releasing HHS' $911 billion budget request, which sees an increase of $51 billion or 6% over fiscal 2010, attempted to downplay reform's impact on the request. The request for the CMS in fiscal 2011 is $784.3 billion, a net increase of $48.3 billion or 6.6% from last year. About 51% and 33% of the overall HHS budget is marked for Medicare and Medicaid, respectively. The total net Medicare outlays would be $476 billion. There are no specific budget allocations based on any kind of implementation strategy for healthcare reform, she told reporters. However, “the platform is there for health reform to move forward,” she added, stressing Obama's commitment to the issue in his State of the Union address. There are a number of efforts contained in this budget “which certainly go a long way toward strengthening public health infrastructure, and provide additional coverage with children's health outreach and community health centers,” Sebelius said. The request isn't a substitute for reform, however, she added. “I know that conversations continue with House and Senate leadership,” she said of the reform bills stalled in Congress. 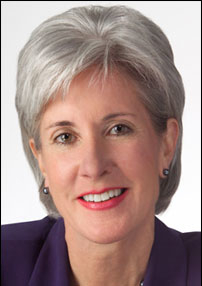 Ultimately, health reform and HHS should work in tandem to improve the system, Sebelius said. In no way does the request replicate the efforts in the health reform legislation “to reach out to the 30 something million Americans who have no health insurance at all and those who are woefully underinsured. This budget absent health reform will still leave a major coverage gap” and does little to address cost containment, she said.